Are you a business owner? Then you may already know how important your customers are for your business. And you strive to keep them happy and satisfied, isn’t it? This is where customer centricity becomes important. Customer focused excellence is a value that is embedded in the behaviours and beliefs of high-performing businesses or organizations. Your customer can be the potential or existing user of your products and services. It may include not only the end users of your products, but also the people who are immediate users or purchasers, for example, the organizations that use your products as an input in their processes. So when you talk about developing as well as integrating your organization’s strategic directions, you should focus on your customers too. 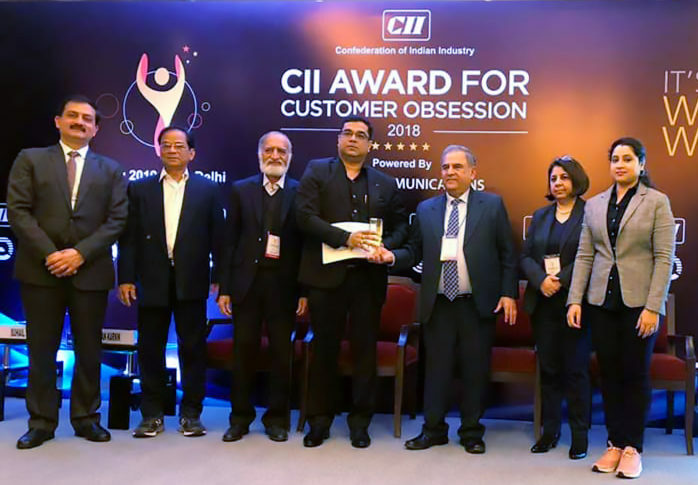 For promoting a Customer Obsession Culture in the Indian Industry, the Confederation of Indian Industry (CII) institutionalized an award named the “CII Award for Customer Obsession” in the year 2026. The CII award recognizes Customer Centric organizations that go all the way to ensure that the customers are completely satisfied with their services and where the customers are given the top priority. And at Digital Aptech, we are proud to be recognized as one! We have received the prestigious “CII Award for Customer Obsession 2018” on 22nd January, 2019 for active customer engagement in the services sector among the small and medium businesses. We have bagged the award in two categories: “Recognition for Active Customer Engagement Services” and Special Recognition for “Leveraging Digital Technologies for Superior Customer Experience Services”. Powered by Tata Communications, the award ceremony was held at the Indian Habitat Centre, New Delhi. We are the only company to have won this award in this segment among some of the top companies in India! The winner selection process involved an in-depth analysis of the profile, mission, vision, value statements, services, clientele, market presence and strategic and operational qualities of the company. Digital Aptech Pvt. Ltd. was given this award by CII for showcasing efficient, progressive, adaptable and strategic as well as operational qualities in offering services and satisfying customers. We are proud and honoured to have won this award. It emphasizes our promise of providing the best design and development services to our clients, being one of the top Digital Agencies in India. We strongly believe in customer centricity in business and this recognition by CII has inspired us to continue our journey forward. Our customers have always been a priority for us and will always be in the future. It’s a proud moment for us and we are really thankful to our valued customers. Without their support and trust on us, this wouldn’t have been possible.